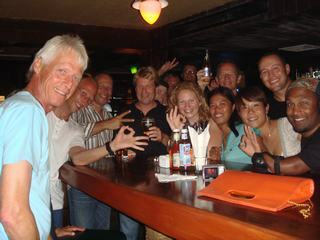 The Dive Asia Staff Party was the highlight last weekend here in Phuket. Our team occupied the entire karaoke lounge at the Ruan Tamachart Restaurant in Chalong Bay and clinked glasses for the last and the upcoming season. 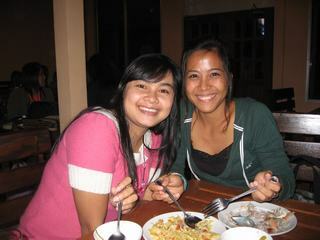 Delicious food, cold beer, and lots of fun made the evening a huge success. 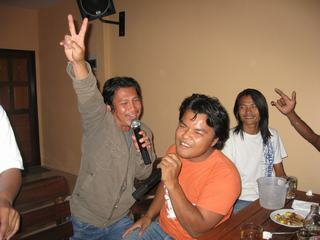 The karaoke machine played international and Thai songs throughout the night. 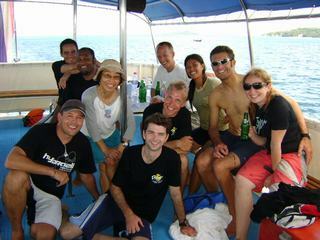 The Dive Asia team and a few guests gave their very best performances at the microphone and earned standing ovations. Many people danced — driven by the hard beats — until the late night hours and enjoyed themselves very much. 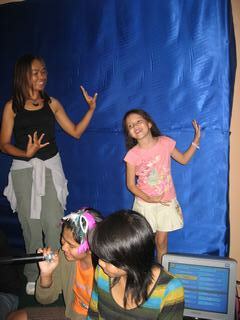 You can watch the video at YouTube. On Sunday 13th July, our IDC candidates completed their PADI Instructor Examination; after a 9 day training program, countless hours of preparations, presentations, diving skills’ practice and lots of fun. Participants from Denmark, Switzerland, Germany, Philippines, South Korea, England, Brazil, Sweden, France & Japan bonded and became close friends; a truly international team. Our PADI Course Directors, Bjorn and Akio, worked with enthusiasm and as hard as usual to prepare the future PADI instructors for the real world. We wish the newest members of the PADI Instructor family all the best for the future, lots of success and of course, a lot of fun. 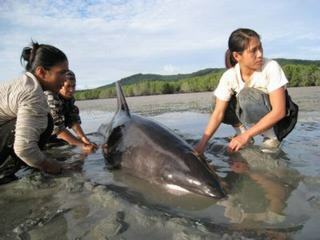 Three rough-toothed dolphins were rescued after they were found stranded last Saturday on mud flats created by the receding tide at Ao Makham on Saturday. The dolphins, two females and one male, were found by fishermen who, together with local villagers, helped keep the dolphins’ heads and skin wet. They also informed the nearby Phuket Marine Biological Center (PMBC), whose marine biologists came to give basic treatment to the dolphins before taking them by boat back to the sea. According to PMBC experts who rushed to the scene, the dolphins were more than 20 years old, weighed more than 100 kilograms and were more than two meters in length. However, they were puzzled as to why the dolphins were found in the mangrove as they were in good health and this species of dolphin is rare in Phuket waters. 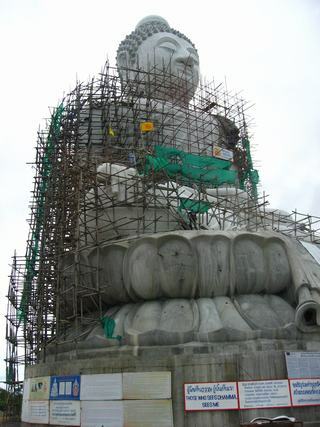 Phuket is well known for its seafood restaurants and the Kan Eang 2 in Chalong is certainly a “must see” attraction. 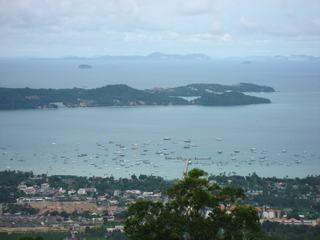 Not only is the delicious food worth a visit but also the stunning view on the bay where dozens of boats are anchored. 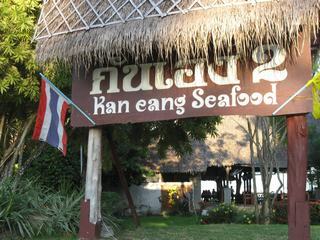 Directly on the beach you will find the spacious restaurant just a few hundred meters north of the Chalong Pier on the way to Phuket Town. The menu is comprehensive and to make a choice is difficult. Lobster or prawns, fish or squid, fresh vegetables, or perhaps you prefer chicken or pork; at Kan Eang 2 you can find anything in every variety. A cold beer or a nice wine makes your seafood dinner perfect. 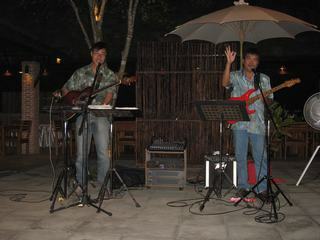 For your entertainment you can enjoy well known Western music from a two-person live band. 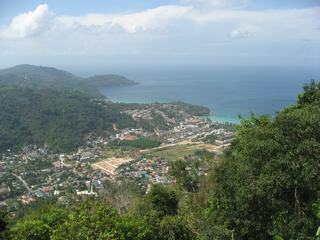 Even if you stay in Patong it is worth the 30-minute ride to escape the hustle and bustle. 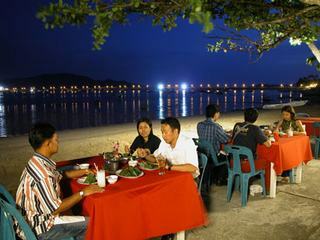 It’s a pleasant experience to dive into a typical Thai seafood restaurant on the beach. You can’t hear any cars or motorbikes, there is always a slight breeze from the sea coming, and the price for the food is decent with 80- 180 Baht per dish being the average. Highly recommended is the snapper in sweet & sour sauce and Yam Pla Dok Fu (fried catfish with mango salad and cashew nuts). 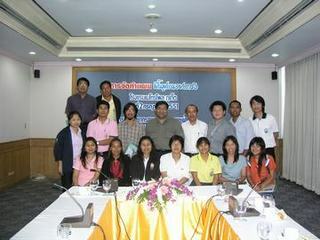 The Department of Marine and Costal Resources, a body of the Thai Ministry of Environment, and the Science Department of Ramkhamhaeng University — one of the leading Universities in Thailand — invited leading Dive Center Management to a meeting discussing coral reef protection. This was held on 2nd July. 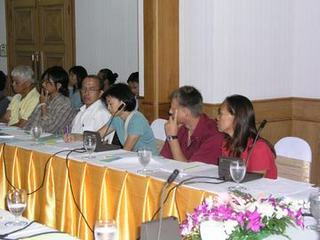 Present were management staff from the Marine National Parks, the Tourism Authority of Thailand, as well members of the Phuket Provincial Administration. 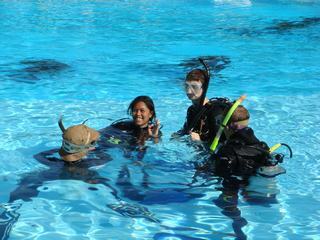 Dive Asia’s instructor Bee also attended. 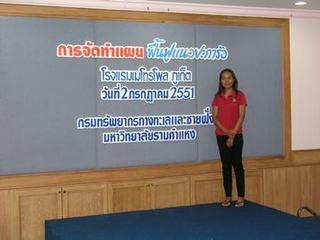 great honor for her to share her experiences from the front line with science and government officials.